Free Irish sheet music White, Orange, and Green is a number one favorite song in my music studio. I give it to voice, piano, and guitar students. In a beautiful and very singable melody, it tells the story of a daring young Irish girl who flaunts her country's flag before an English soldier. This is a very special song, and in giving you this free Irish sheet music, I am giving you one of the most treasured repertoire pieces in my studio. Though this folk song is public domain music, you will not find it anywhere else... at least for a while! Beginning singers really enjoy learning White, Orange, and Green. It reminds me of another Irish song, Wearing of the Green, in which "they" (the English) have "gone and passed a law against the wearing of the green." Just as the teller of that story says that he'll keep on wearing the patriotic color until the English can stop the shamrocks from growing green, so in this song the spirited young girl declares she won't give up her banner of white, orange and green until blood has been spilt! For guitar players, (see farther down the page) the key of D is perfect. This song is usually how I introduce the Bm chord to them, and we play each verse with a different style of accompaniment; combination bass plus strum, and different styles of fingerpicking. With piano students, this song presents a chord-playing challenge also. In addition to the arrangement I have written here, I have kids try to give each verse have a different feeling by using a variety of chord patterns. For that, practicing with a lead sheet is perfect. 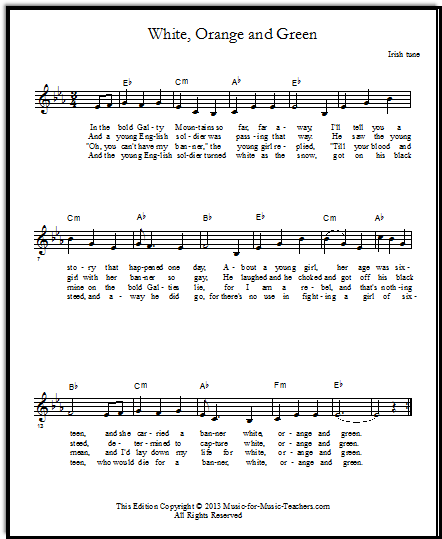 This free Irish sheet music tune is easy, but with good opportunities to train your voice students how to sing better. Just working on the phrasing in this song will teach them a lot about breathing for singing. Beginning singers always want to take breaths right in the middle of sentence clauses. They're just used to it! I like to stop playing the piano, occasionally, and stare at them without a word after they have taken an inappropriate breath, and they know at once what they have done. They might even breathe right in the middle of a word - something they would never do if they were TALKING. Imitate them, by speaking the phrase, then singing it. The commas come frequently enough in White, Orange and Green that controlling breathing is really quite easy IF THEY THINK ABOUT IT. Because the range is small -- only a 9th -- young singers will feel comfortable with the notes... except for one phrase. In the third line, the notes leap up a 6th, and it somehow feels like an extremely high note (by comparison). Some kids will squeak or pinch it out, imagining unreachable heights. So we may practice that spot with sliding notes (a "siren") to show them that it is easily attainable. It's almost more psychological than physical. I suggest to them that on the words "her AGE was sixteen" they use the "-r" on the end of "her" to help pop them up onto that high note on the word "age." If they can roll the "r" enough to sound almost like a "d", even better. One fun thing I ask students to try with this song (IF THEY ARE BRAVE ENOUGH) is to put on a fake Irish accent. This may seem corny to some (and won't fool any Irish folks, certainly!) but it helps singers step outside their safety zone and imagine themselves into the story. Regarding the pronunciation, encourage your students to EXAGGERATE THE CONSONANTS. Particularly with words that are unfamiliar or antiquated, such as "steed", the audience will be baffled if they can't clearly perceive the meaning. I instruct my students to pretend they are singing to a group of 3-year-old children, and must enunciate extra clearly. The guitar sounds beautiful fingerpicking this song, and even your young students who prefer strumming are going to want to pick this, for at least a couple of the verses. There are exactly 6 beats that way, instead of 3 for strumming. I said you wouldn't find this free Irish sheet music White, Orange, and Green anywhere else. Well, you won't find it precisely like THIS arrangement, and with exactly these words. That's because my daughter, Elizabeth, substituted the words "black steed" for the original syllables, "machine." Yes, that's right -- the original words talk about the soldier getting off and on his MACHINE. We'd rather sing about a horse; even better, a black steed! Also, I have recently run across the same melody used with different lyrics, in an old book. This is surely one of the reasons folk song variations abound! Since the original composer is nowhere to be found with this public domain music, you get to decide what you want to say and sing. Another version of this old song is titled "The Gay Galtee Mountains," with mostly similar words (and an extra verse) but a different tune. 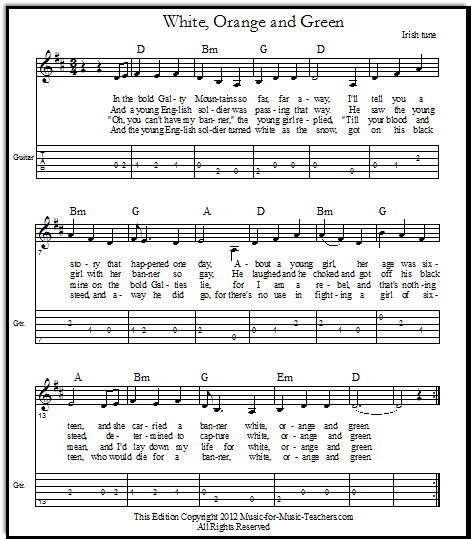 I hope you love this free Irish sheet music as much as we do!